Something I’ve considered as I take my tour through different countries is how much food costs. The ingredients are easy to find and inexpensive – in the respective countries – but not so cheap or available to everyone in the US. Full disclosure: my grocery bill is high each week. This food blog and cooking in general is my hobby and passion. I am willing to shell out a little extra each week to fuel that passion. But not everyone is in a position to do that. Or wants to. So when I stumbled across this quote in my holy grail for the month of Spain I knew this is how I would approach those more expensive dishes. This is clear, sound advice for Spanish month. Especially when you live in an area of the country that doesn’t have access to fresh seafood daily. Or if you do, it’s a million dollars a pound. I love this concept. Take a special/hard-to-find ingredient, then add to a dish in small quantities to make the whole thing special. Wild mushrooms are that special ingredient in this case. 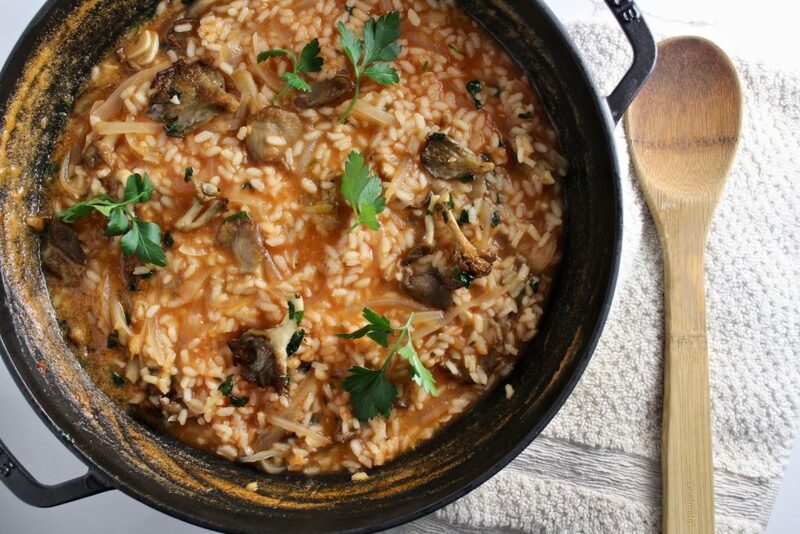 You could easily swap out jamon, squid or mussels for the mushrooms in this Rice with Wild Mushrooms. 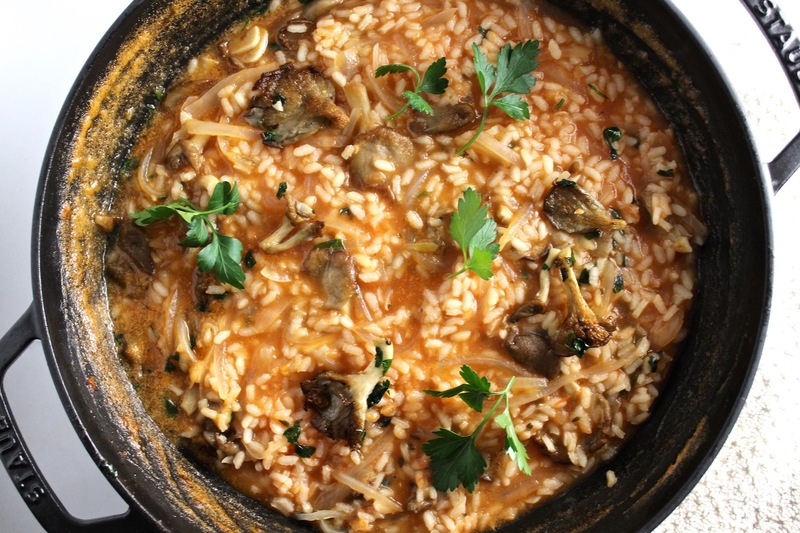 I love that the wild mushrooms are the stars of the show, but the rice is not second fiddle. Spaniards use Calasparra or Bomba rice, which is specific to Valencia region of Spain. Apparently all rice in Spain comes from this region. This rice is (one reason) why paella is so delicious – because the grains can hold so much liquid (FLAVOR) while remaining firm. Turns out Arborio rice can do this too. And if you’re on a budget, this is a great option when making Spanish rice dishes. I used it for Rice with Wild Mushrooms and this rice packed so much flavor, I’ll eat this all day while saving up for Bomba rice. * A note on the tomatoes. To peel, mark an X at the bottom of your tomatoes with a knife, boil water on the stovetop then add the whole tomatoes for about 30-45 seconds. Drain, rinse with cold water so you can handle them, then peel the skins off. Puree in food processor or blender. You CAN use canned, but I promise you will not have the same fresh taste. But if this is a barrier between you and this rice, go for about 22oz (or similar sized) can of crushed or pureed tomatoes. * A note about the rice. 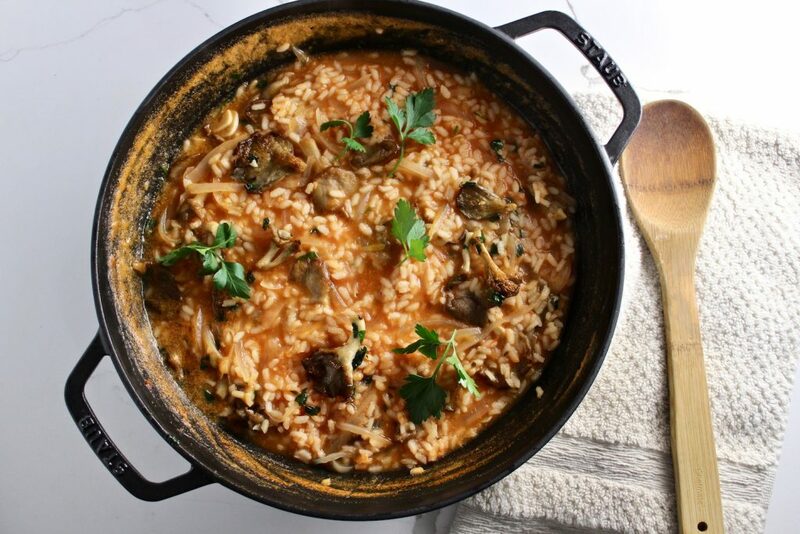 The original recipe calls for a Spanish rice called Calasparra. Of course, you can buy this on Amazon but I didn’t feel like spending that much. I’d read that Arborio is a good substitution and it worked out perfectly. Heat half of your olive oil in a very large pot or deep frying pan, over medium heat. Add your saffron threads, stir for 30 seconds, then add your sliced onions and 1/2 tsp of salt. After about 5 minutes when your onion is translucent, add your garlic, thyme and bay leaves. Stir for about 2-3 minutes until garlic is soft. Increase the heat to high, and add the white wine. Let this boil for 2 minutes. Reduce the heat to medium and add the pureed tomatoes. Let simmer for about 10 minutes. Add the chicken stock, bring to a boil, then add the rice and remaining salt to the put. Let this simmer, stirring every once in a while, for about 20-30 minutes. While this is happening, heat the butter and remaining olive oil in a skillet on medium high heat. Cut the rough parts off the mushrooms and add them to the skillet. DON’T MOVE THEM for at least 2 minutes. You want the browned effect on the bottom of the mushrooms. Flip or stir the mushrooms so they are cooked, season with a little salt. 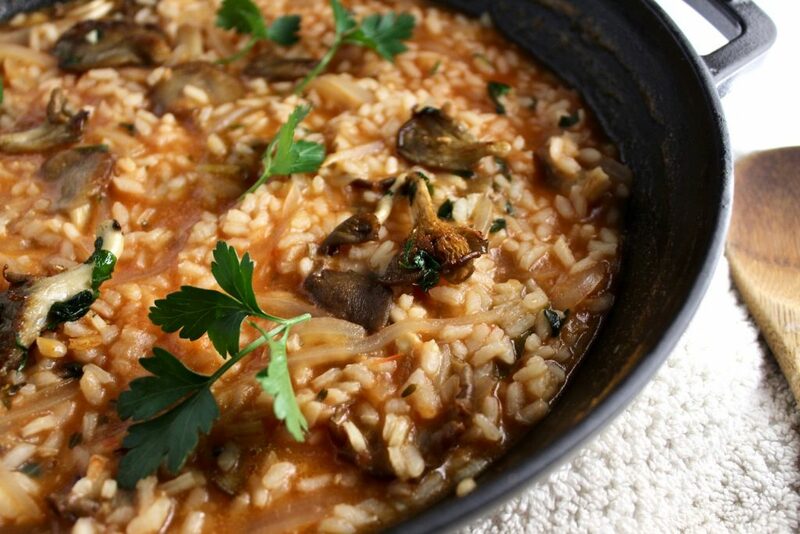 Once your rice is soft and the liquid is mostly absorbed, remove from heat and stir in the mushrooms. Let stand for about 10 minutes until you dig in.